I wanna start this off with a rather depressing observation: unless you're dating Britney Spears or you own Microsoft or something, most of us merely tolerate our lives; seeking the peaks and dreading the dips. However, despite this rather bleak outlook, every now and then the right elements mix at the right time with just the right amount of luck and we find ourselves in the middle of something far beyond our best expectations. 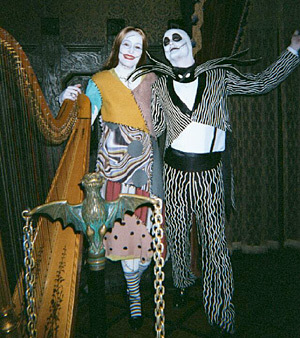 For thirty of us, on the evening of October 25, 2000, the Haunted Mansion Fantasy Dinner was one such moment. Ad-dict tr. v. 1. To devote (oneself) excessively or compulsively. 2. Informal. A devotee: a TV addict.--ad-dic-tion n.
The last week in September, my credit cards are still kicked from repairs on my van, so I rifle through my laserdisc collection, pulling out duplicate titles that I know a friend wants. I trade them to him for some serious high end satellite gear; I then take the gear and trade that (with installation included) to another friend for a laptop that he won in a contest. I sell the laptop to a third friend for two grand. Now I've got enough to order a ticket. October 2, at 11 AM here in Washington, DC, tickets to the dinner go on sale. I get my ticket request e-mailed by 11:16, then sit around pretending that it won't bother me if I don't get one. At 11:56 AM I get a response to my e-mail request: I've got a ticket. Two days later I finish bouncing off of the walls. The following week I got a package Fed Ex'd from Disney with a rough itinerary for the dinner, along with details on the Disney Divas event. A few days after that I got a call at work from Martha at Disney Guest Services. She asked me when my birthday is and who's my favorite Mansion character? I told her I've always been kinda partial to the Ghost Host. We chatted for a few more minutes and then went our separate ways. My birthday? Favorite character? Hmmm... Two weeks later I'm across the country and in the lobby of Disney's Pacific Hotel, registering for the event. I'm wearing (as are several other guys) black pants, black shirt and black boots. I'm also sporting a hand-painted tie of Madame Leota with several of the instruments from the seance swirling over her head. Truly a target for Fashion Autopsy and the Fashion Coroner. Fan art at it's tackiest. And oh yeah, it glows in the dark. At registration, all of us received a more comprehensive itinerary for the dinner, the Club 33 luncheon and the Divas event. We also got these waycool blue wristbands and nametags that made me feel I like I was on a fourth grade field trip (ah, if only we'd had field trips like this back in the day!). Alice Davis arrived long enough to register and greet us, then she left a little ahead of us for the Mansion. After the thirty of us socialized a little longer, three limos, two black and one white, pulled up to the front door of the hotel. The drivers appeared to be quite dead, moving stiffly, showing no emotion, eyes staring out blankly from dark hollows. Our driver was a pretty cool guy (no pun intended). I asked him if it bothered him being dressed up like that. "Nah, it's just a gig." We got into the cars and they pulled off towards the park. After making a left onto South Harbor Street, we passed the main entrance to Disneyland and proceeded a little farther up until we reached a large industrial-looking gate. The gate keeper waved us through and we continued on, moving through the service roads and back alleys of Disneyland. And yes, they have Mickeys painted everywhere, even on the things that the public never sees. I guess it's kinda the corporate equivalent of a visual mantra: it helps ya keep your focus. Finally, we reached another gate and the limo drove through and into the park itself, pulling out right near Big Thunder Mountain Railroad. We wound slowly through the park pathways, then rounded a curve and found ourselves facing a huge fogbank on the edge of New Orleans Square. Several well-hidden industrial fog machines were working overtime, pumping out huge amounts of the white stuff; the Mansion and grounds were completely immersed in a swirling, creeping mist. Red spotlights had been placed at the base of the trees shining up the trunks and into the branches and blue and green lights were mounted low by the pathways, lighting up the front facade of the Mansion. The limos came to a stop, dropping us off right at the front gates to the Mansion. There we were greeted by Disney Guest Ambassadors Bruce, Tony, Martha, Heri and Doina. 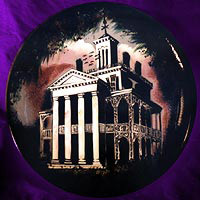 We entered the grounds, and there in the fog by the main walkway were thirty new tombstones; one for each of the diners. They were cut from half-inch foam core and expertly painted to look like chiseled marble. 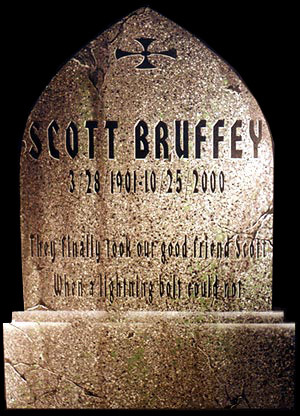 Each had its own epitaph (the birthday question solved). We spent a few moments reading how we all died, comparing deaths and listening to the zombie trio (guitar, violin, and forgive me but I forget what the third instrument was; just too much input) that was performing at the end of the walkway next to the hearse. After we'd all moved up towards the front door, our host for the evening, Jack Skellington from The Nightmare Before Christmas ("My friends call me Jack. Are you my friends? Then please, call me Jack!") walked down the front steps and ushered us into the foyer where champagne was being served. Retired Imagineer Rolly Crump was also waiting for us and we all spent a few more moments milling about, schmoozing and drinking in the foyer and stretching gallery before descending down into the Great Hall (the Changing Portrait corridor) where a long dining table stood set for thirty and heaped with dozens upon dozens of dead flowers. 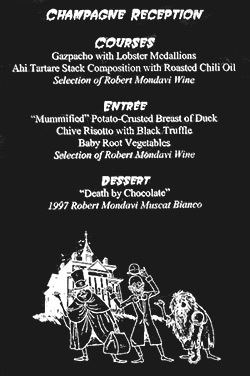 Each setting was graced with a severed Mickey hand holding a menu for the evening. To the left of the table and opposite the portrait wall sat Jack's patchwork girlfriend Sally, playing a harp. She provided the musical accompaniment for the evening, playing a truly eclectic assortment of music: Blondie, the Beatles, the Police, Led Zeppelin. As Jeff, one of the diners put it: "No one's going to believe this. People are going to ask me, 'So Jeff, what did you do last night?' and I'm going to have to answer them 'Oh, I had dinner in the Haunted Mansion while Sally from The Nightmare Before Christmas played "Stairway to Heaven" on a harp'". To Sally's right lay a long coffin underneath one of the windows. After we were seated, Jack introduced Alice Davis (who among many other things designed the costumes for the It's a Small World attraction). He also introduced some other surprise guests: Gus, the ball and chain hitchhiking ghost, the knight from the Infinite Hallway of the Mansion, and finally, a vampire who had been lying in the coffin below the window. Lacking a final member of the quartet, they grabbed one of the Mansion cast members and proceeded to perform several barbershop quartet-style songs, all of a rather grim (but very funny) nature. They returned several times through the dinner; each time the vampire was greedily eyeing the cast member's throat and each time the cast member was looking paler, more drawn. Finally, someone asked him what the problem was. Dazed, he answered, "I see dead people." Dinner itself was an excellent three course meal (see menu below). 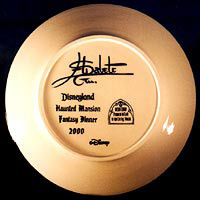 When we had finished dessert - plates of elaborate dark and milk chocolates in hand-crafted shapes - we are given customized death certificates to certify that we'd died from Death by Chocolate at the Mansion dinner. We then leave the table and ride through the Mansion. When the ride is completed, the lights are turned on and we're separated into groups of seven and eight and given a backstage tour of the Mansion. I'm little hesitant about going on such a tour; I feel like I'm looking at my parents naked. After about ten seconds, though, that feeling is gone, replaced by the fascination at finally getting to see and scrutinize all of the details that are unfortunately all too hidden by the normally dark condition of the ride. Most of the trivia about the ride is well known by devotees, so I won't go over old territory here, but some new bits did spring up: the wine bottles in the ballroom are Moet; Madame Leota's name is spelled "Leoda" on the doors and signs leading to the Seance room; when Eleanor Aubrey died, her daughter donated her favorite scarf to the ride which is the scarf now worn by Madame Leota in her crystal ball. The screams that accompany the pop-up ghosts in the attic and the graveyard were eliminated because too many kids were scared by them and it was decided to "soften" the ride a little more. Our guide was unsure as to why the Bride was changed; speculation ranged from the aforementioned "softening" attempts, to the desire of the Imagineers to keep the ride "fresh" by constantly changing it. Other bits of trivia: the person who shot a hole in the ballroom glass in 1984 wasn't caught (this was during the pre-surveillance days); the graveyard musicians are the last to shut down in the ride at night--which we were told sometimes creeped out whoever was closing; Little Leota never shuts down--she runs 24-7. "This is especially creepy," our guide confided. "When I'm on the late shift, as I'm leaving the ride, I'm followed out by the faint cry of 'Hurry ba-a-a-ck...'. Okay, okay, I will! Just leave me alone!" After the tour, we rode through the Mansion again, only this time costumed cast members were hiding, lying in wait to add some scares. As we leave the Mansion, a dead Bride and Groom are standing outside. The Groom whispers, "I do." I point to the Bride and ask, great, but does she? Everyone laughs and we are turning to go when the Bride moans, "I don't." Someone else suggests that maybe that's why he killed her and stuffed her in the attic. We bid our hosts good night (especially Catherine, Mansion cast member and total hotty), strongly hinting, winking, suggesting and begging that this become an annual event. For the next couple'a days, whenever we were surprised at yet another cool thing planned for us, instead of grinning and thanking our hosts (especially Martha who has the patience and humor of a saint), someone (usually me) would just cry out, "Annual event!" in some twisted tribal way of acknowledging thanks. Back in the limos we were given a driving tour through the rest of the park. Security officers and workmen, puzzled, watched as the three cars rolled past them. Someone in the car made the suggestion that this could be a new event at the park; Disney Executives on Parade. Everyday at lunch, limos with onyx-tinted windows could prowl slowly through the park while a single hand waves at the Tourons through a narrow gap in the back windows, thanking them for their tithes. Since we'd gotten on the subject of other cool stuff that Disney could do, the suggestion was made that they should host an Indiana Jones event that features a Mongolian barbecue on the Bridge of Death. Personally, I find the idea of cookin' s'mores over the flaming skull to be quite intriguing. When we arrived back at the hotel and went up to our rooms, we found our tombstones waiting for us, along with a plate featuring our favorite Haunted Mansion character hand-painted by Elisabete Gomes (I found out later that all the plates were on display in the Foyer of the Mansion, but Ol' Eagle Eye here apparently walked right past them and never even saw them). The character mystery is also solved.